Revenue in the Small SUVs market segment amounts to US$192,786m in 2019. From an international perspective it is shown that most revenue is generated in China (US$192,786m in 2019). This Market segment includes light trucks, used as family vehicles of an average footprint around 4.25m2 (44ft2) and an average mass around 1610kg (3610lbs). Early SUVs originated form commercial repurposing of the military vehicles used around the Second World War, although those initial models were marketed as station wagons for over fifty years, before finally being called sport utility vehicles in the late 1980’s. In the USA, they rose to popularity in the end of the last century with two major factors influencing their increase in sales: firstly, EPA (United States Environmental Protection Agency) classified them as light trucks, changing how they are regulated in respect to fuel efficiency, and, secondly, American manufacturers, influenced by competitive prices of imported, smaller models, focused on a more profitable production of larger cars, driving prices of SUVs further down. After the financial crisis in the late 2000’s, sales of the Small SUVs recovered quickly and continued to rise, influencing many companies to redesign their models to suit this new market trend and making crossover SUVs the fasted growing trend today. Example Models: Daihatsu Terios, Kia Sorento, Kia Sportage, Land Rover Freelander, Mitsubishi Outlander, Peugeot 4007, Suzuki Grand Vitara. 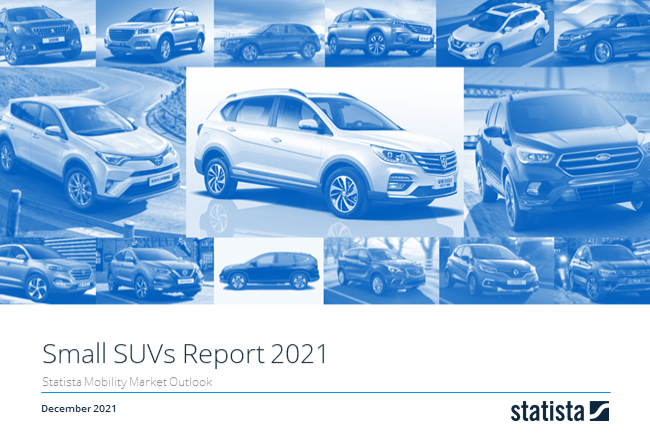 Reading Support Revenue in the Small SUVs market segment amounts to US$192,786m in 2019. Reading Support In the market for Small SUVs, volume is expected to amount to 11,053.0 t cars by 2022. Reading Support The average price per unit in the market for Small SUVs amounts to US$20,166 in 2019. Reading Support With a market volume of US$192,786m in 2019, most revenue is generated in China. Here you can find more studies and statistics about "Small SUVs".